WSU researchers have determined that Nez Perce Indians grew and smoked tobacco at least 1,200 years ago, long before the arrival of traders and settlers from the eastern United States. Their finding upends a long-held view that indigenous people in this area of the interior Pacific Northwest smoked only kinnikinnick or bearberry before traders brought tobacco starting around 1790. 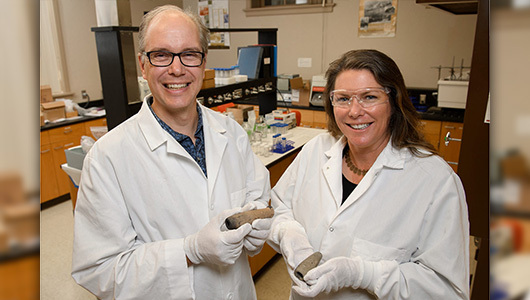 Shannon Tushingham, a WSU assistant professor and director of its Museum of Anthropology, made the discovery after teaming up with David Gang, a professor in the Institute of Biological Chemistry, to analyze pipes and pipe fragments in the museum’s collection. Tushingham first became interested in the subject when, while excavating plank houses in far northern California for her dissertation, she came across two soapstone pipes. Nicotiana quadravalvus is one of several species of tobacco that indigenous people used in religious and ceremonial practices. Art by Emily Hull. Indigenous tobacco is scarce in the cool climate of the northwest. 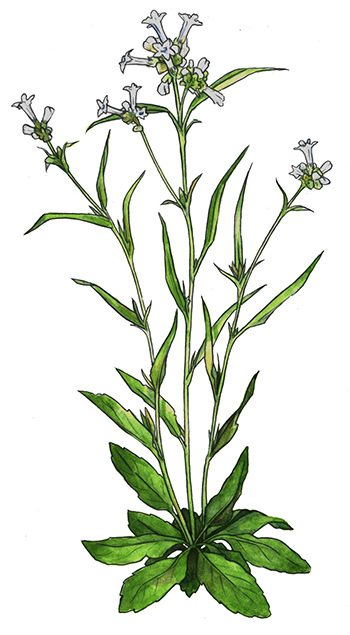 Coyote tobacco, or Nicotiana attenuata, is found mostly on sandy river bars, while the natural range of N. quadrivalvus lies south of southwestern Oregon. Meanwhile, the more potent dried trade tobacco was easy to transport in bundles, or “twists,” and Hudson’s Bay Company explorers, fur traders and the Lewis and Clark expedition found an eager audience for it as they came through the region in the 1700 and 1800s. “This occurred so rapidly and so early in the historic record that a complete understanding of in situ pre-contact smoking practices has been obscured,” Tushingham and Gang write in their paper. In the 1930s, anthropologist Alfred Kroeber oversaw a survey of more than 200 tribes and bands west of the Rocky Mountains. In one of the ensuing monographs, “Salt, Dogs, Tobacco,” he reported that the smoking of nontobacco products was “more universal,” with planting confined to a “long irregular area” from the Oregon coast into south-central California. An accompanying map, however, shows three spots in the Columbia River basin where tobacco could have been mixed with kinnikinnick. Working with Nez Perce tribal leaders, Tushingham and Gang analyzed a dozen pipes and fragments from three sites on the Snake River. Gang said he could use a solvent to get the substance from a pipe and analyze it using mass spectrometry. That left the pipes intact. Results were inconclusive, but the pipe was fine. The researchers did detect nicotine in pipes from both after and well before Euro-American contact. None appeared to contain arbutin, a compound associated with kinnikinnick. Because tobacco in the interior northwest needed to be planted, Tushingham said their finding offers a new view of native interactions with the landscape. Indigenous people have often been thought of as “passive consumers of the environment,” yet they managed camas and even grew clams on the coast, she said. The researchers hope that their findings will inform native smoking-cessation programs, acknowledging the deep cultural role of tobacco while addressing health problems. The research was funded by the National Science Foundation. The other co-authors on the paper are Korey Brownstein and William Damitio of WSU and Charles Snyder of the University of Tennessee Health Science Center.